Led by a member of Exhumed, and boasting an already enviable discography of Death-inspired delights, (Savage Land, Dimensions of Horror), Gruesome are back, continuing their remarkably detailed and authentic homage to the mighty Death. On Twisted Prayers they’re up to the Spiritual Healing period. 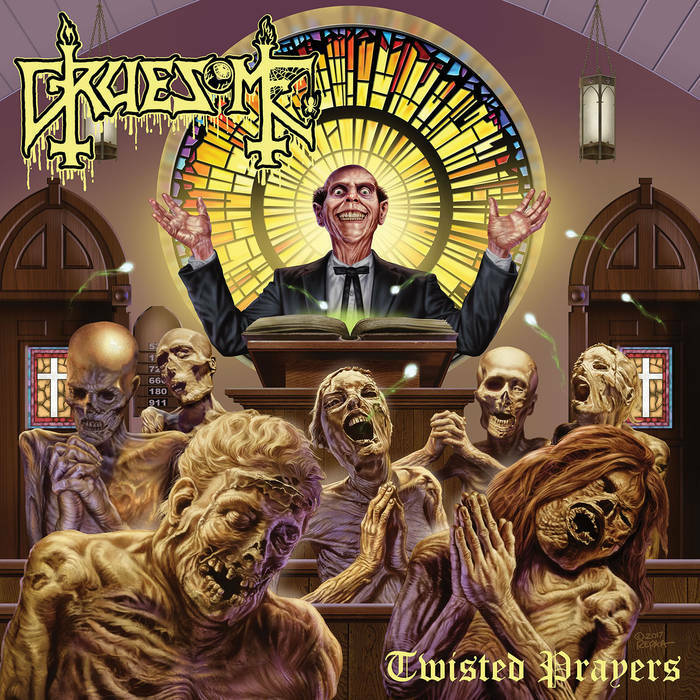 So yes, following the path that Death took, Twisted Prayers develops a more intricate, progressive delivery, while also incorporating some elements of ripping thrash into the music here and there. This progression in sound is handled by Gruesome as effectively and completely as you would hope for. The songs on Twisted Prayers are so shockingly Death it’s just remarkable. I can’t help but really, really like Gruesome. With some first-rate songs that may be inspired by Death, but are still new compositions that have a lot of death metal satisfaction to offer, Twisted Prayers is not only a worthy follow up to and progression from Savage Land, but also does the music of Death ample justice. Also, I recommend you get the version of the album with the Possessed cover of The Exorcist on it, as it’s pretty damn good. In some ways the entire concept of Gruesome would be a bit redundant and pointless if it weren’t for the fact that they’re so damn good at what they do. They really are hideously enjoyable. When you really stop and think about it, only a talented and skilled group of individuals could even come close to pulling off something like this. Of course, as Gruesome continue to follow Death’s increasingly technical and progressive career path, it’s going to be very interesting and exciting to see how this manifests in their work. I’m definitely up for finding out though. This entry was posted in Death Metal and tagged Death, Death Metal, Exhumed, Gruesome, Metal. Bookmark the permalink.